Nike shares slipped as much as 3.9 percent to $79 as of 9:31 a.m. Tuesday in New York -- the biggest intraday slide in five months. They had climbed 31 percent this year through Friday’s close. 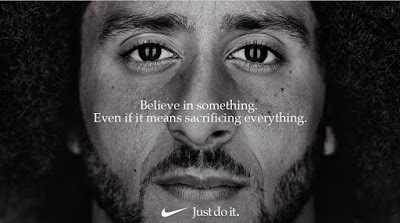 The fallout was no surprise but Nike may be betting that the upside of a Kaepernick endorsement is worth angering conservative Americans and supporters of President Donald Trump. Just a few weeks after Trump’s inauguration last year, the company launched a high-profile “Equality” campaign featuring LeBron James and Serena Williams. The campaign’s ambassadors included Ibtihaj Muhammad, a Muslim American fencer who wears a hijab when competing, and transgender triathlete Chris Mosier. Now, all of this, of course, is about market share, but it is nonetheless refreshing to see a company taking a calculated risk while so many in Trump's America seem so keen on hewing to a very conservative, even reactionary, line. And of course, for students of human nature, the reactions to this campaign constitute a fascinating Rorschach test, yet another conduit into the tortured and fractured American psyche. Not to mention another dog whistle for the increasingly beleaguered Trump to blow. Another day, another example of the degeneration of civil society in the United States of America. At times it appears that half of the population is turning feral. Can that be accidental, some sort of fluke? Or is it, as I've long suspected, the predictable outcome of how they've been quietly groomed over the past two decades? A leadership void has made Americans ripe for a Lord of the Flies remake, Mound. .. 'to own the liberals' - talk about a bizarro rationale. In other words' destroying Nike products really has nothing to do with the purpose behind Kaepernick's decision making.. but everything to do with being partisan. This campaign and story is going to gain momentum, as our favorite sports stars make decisions for or against supporting Kaep. My prediction is its a winner for Nike.. and will weed out the losers who are just that.. losers, who can't get their dim heads around the 'take a knee' movement and police violence & related rascism. Trump et al, no slouches at extreme partisan behaviour will lose their minds, then attempt to force new 'laws' down the throats of the population.. hell, Trump tries that out on a daily basis. While it may provide temporary oxygen for Trump nation, Sal, I think Nike knows hat it is doing here and it will prove to be a very, very successful and canny corporate move. 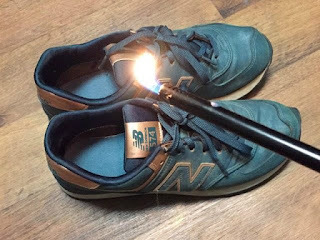 This post, especially the first photo of some dork purporting to set fire to his blue sneakers, sent me scrambling. 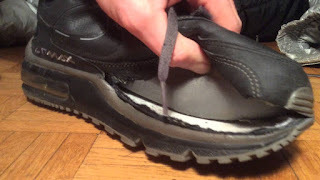 Yes, there's a prominent "N" on the side but the tongue of the shoe plainly has the logo of the manufacturer, New Balance. It took me a while to confirm that New Balance is not some subsidiary of Nike. So this brain dead loser is instead threatening to burn his New Balance sneakers to teach Nike a lesson. The very worst part is how I don't find any of that surprising. As always, the unhinged reactionary right is its own worst enemy, Mound. Would it be OK if I cross-posted this article on my website? There is no fee, I’m simply trying to add more content diversity for Writer Beat and liked what you wrote. I’ll be sure to give you complete credit as the author. You can learn more about the site by checking out my profile (my email and the website address are there) or just reply "sure (via email)" and I'll hanedle the rest. Please feel free to repost as you see fit, Autumn.